As much as this time of the year is about socialising, it’s also important to take the time out to relax. And what better way to unwind than by curling up on the sofa to watch a Christmas film. You might have your own traditional favourites to get stuck into, but if you need some help deciding, take a look at our top ten. So what are you waiting for, grab your bowl of popcorn and turn on Netflix! 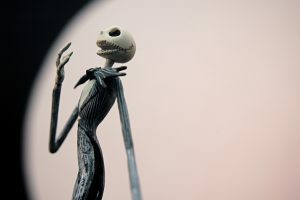 Jack Skellington, a member of the Halloween town community, discovers Christmas and tries to recreate it. However, having lived and breathed Halloween for so long, it proves quite difficult to understand all the aspects of the holiday. 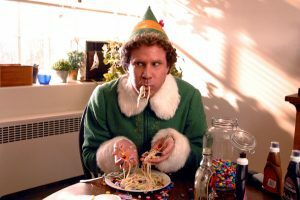 Will Ferrell plays the role of Buddy, a human who thinks he is an elf. After being banished from the North Pole, he tries to acclimatise to being a regular person, with great difficulty. A ‘feel good’ film with typical Will Ferrell humour. This 1994 movie revolves around a failing suicide hotline called LifeSavers and a collection of interesting characters, ranging from a pregnant Juliette Lewis, frantic business owner Steve Martin to the cross dresser Liev Schreiber. A modernisation of A Christmas Carol, Bill Murray is an executive producer in all the worst ways, displaying no signs of compassion for treating his employees badly. He is visited by three ghosts who show him the world he could possibly live in, should he change his ways. 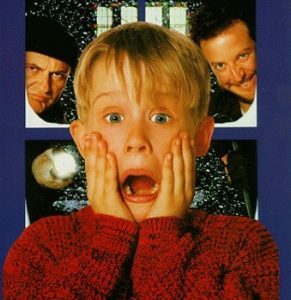 Macaulay Culkin is forgotten by his parents during the Christmas holidays and left to fend for himself in their family mansion. Thinking the house is empty, two burglars attempt to rob the place, but find themselves in a world of trouble. This 1940’s classic puts your heart strings through the ringer. 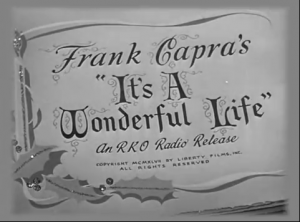 Clarence the Angel is sent to earth to help suicidal George Bailey discover how his life impacts those around him. A family-friendly favourite to get you in the Christmas spirit. This Christmas themed tale about love follows nine characters and how their lives are affected at this emotional time of year. From affairs and young crushes, to recuperating after the death of a loved one, this 2003 classic knows how to swing your emotions. After a parade Santa turns up to work intoxicated, Kris Kringle, fills the position and tries to convince an entire town that he truly is the fictional Christmas character. However, non-believers try and have him committed, resulting in an emotional court battle. The Peanuts kids are back. 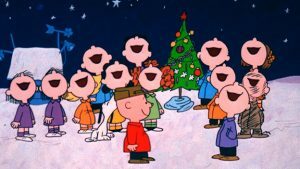 Charlie Brown is struggling to remember the true meaning of Christmas and confides in his friends to help him. It is recommended that he direct a play and after a few hiccups, demands and unruly actors, he finds the answer in an unlikely place. 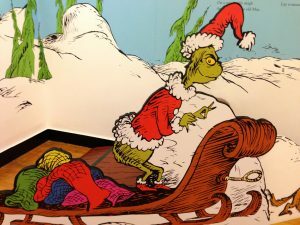 Based on the Dr Seuss classic, Jim Carrey plays the role of the Grinch, an angry loner who despises seeing others happy and takes it upon himself to steal the joy of Christmas from the people of Whoville, learning valuable lessons along the way. So there you have it, ten Christmas film guaranteed to get you in the mood for one of our ultimate Christmas parties! Did we miss any of your favourites? Tweet us @ultimateexp and let us know!